REMINDER: July 5 is deadline for July assistance | love bug foundation inc. The deadline for July pet food assistance is quickly approaching. 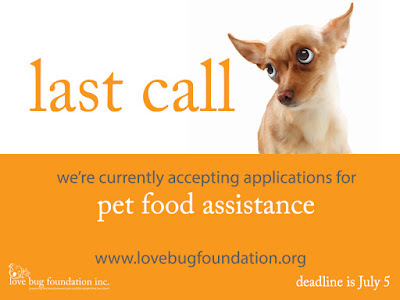 Please call 404-419-6349 to apply or reapply for pet food assistance this month by July 5. All messages will be returned as soon as possible.